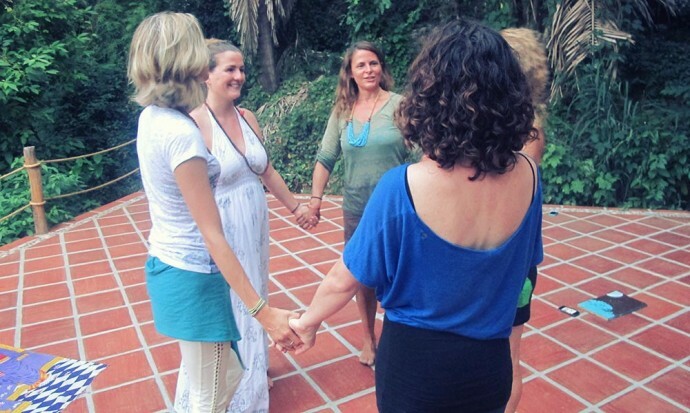 What is a yoga teacher training course really like? Before I started my yoga teacher training course, I really didn’t know what to expect. I’d read the syllabus, the schedule and the description, but there were plenty of gaps that couldn’t be filled. What would my fellow students be like? Why would they be doing the course? Would I be the least proficient? How would my body cope with so much yoga? How would it feel to be in retreat for a whole month, cut off from the outside world? The unanswerable questions were plenty. 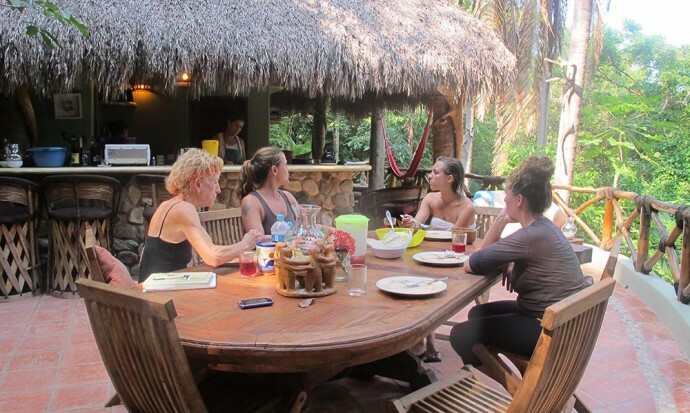 The yoga teacher training took place at Tailwind Jungle Lodge, a gorgeous complex of bungalows, about an hour’s walk outside San Pancho in Mexico. I shared a room with fellow student Julia. We could see and hear the ocean from our beds and were surrounded by lush greenery. Safely under our mosquito nets, we saw different visitors every night – from geckos to an awesome preying mantis. 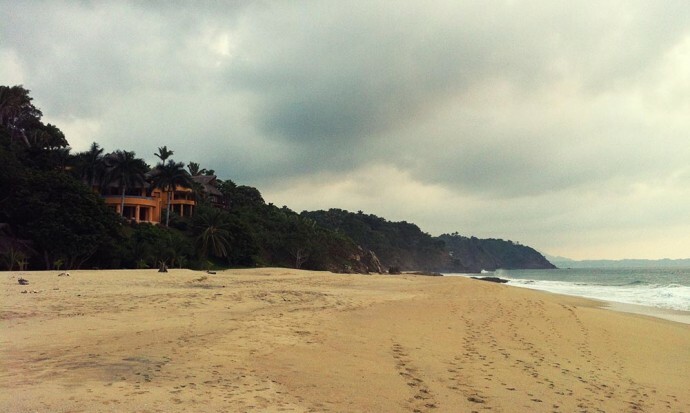 A semi-private beach could be reached via a ten-minute walk through the jungle, and there were hiking trails too. 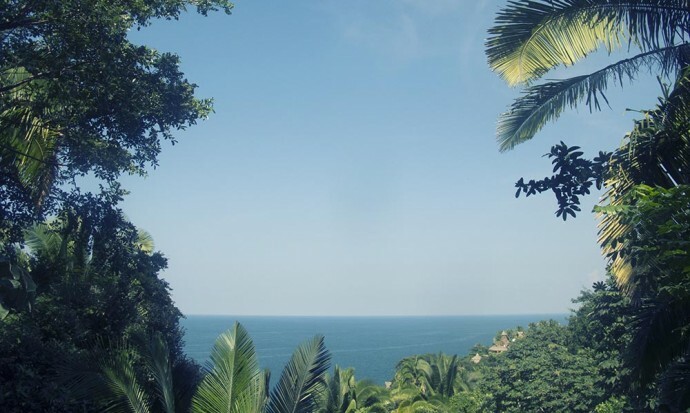 The jewel in the crown of Tailwind was the yoga platform, surrounded by jungle and looking out onto the ocean. It was a treat to spend so much time there. View from my home at Tailwind! The food was provided by local chef Abigail who is a wizard in the kitchen. Every morning we’d get homemade porridge or granola with fresh fruit and seeds. Occasionally we’d be given eggs, cooked in various Mexican styles. Lunchtime was a grand affair, sometimes with three courses, and always made with the freshest ingredients. 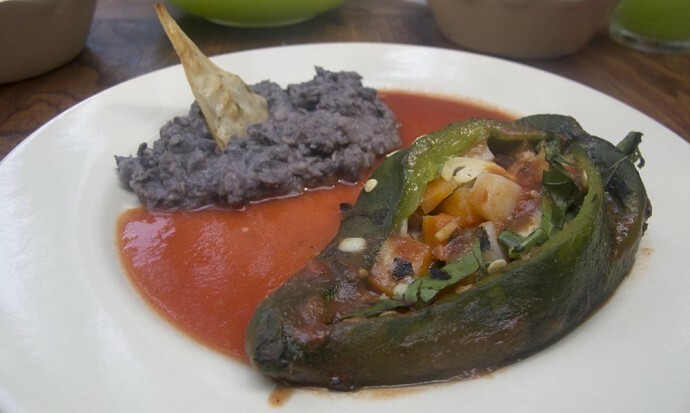 My favourite meal was a stuffed poblano chilli with rice and salsa. Abigail went home in the evenings but would leave food for us to heat ourselves – perhaps enchiladas or a chunky soup. Stuffed poblano chilli – delicious! I expected from my correspondence with one of the teachers, Carri, prior to the course that we’d get along and I was right. Fellow teacher, Sarah, was equally excellent – both being wonderfully down-to-earth people that sparkle with mischief. Best of all they were excellent teachers and practitioners. They gently but firmly coaxed all of us into being better yoga teachers, and made us realize we could do it. I also spent a fair bit of time with Carri and Sarah outside of class and am delighted to now call them friends. Luckily for us, we were a very small group (three students in total) meaning we got lots of personal attention. It also meant that it could, at times, be quite intense as personalities inevitably clashed – but that was all part of the journey. My fellow students were Julia, who is in her thirties, and Ruth, who is 60 years young. Julia is a trained health coach and has practiced Anusara yoga for years. 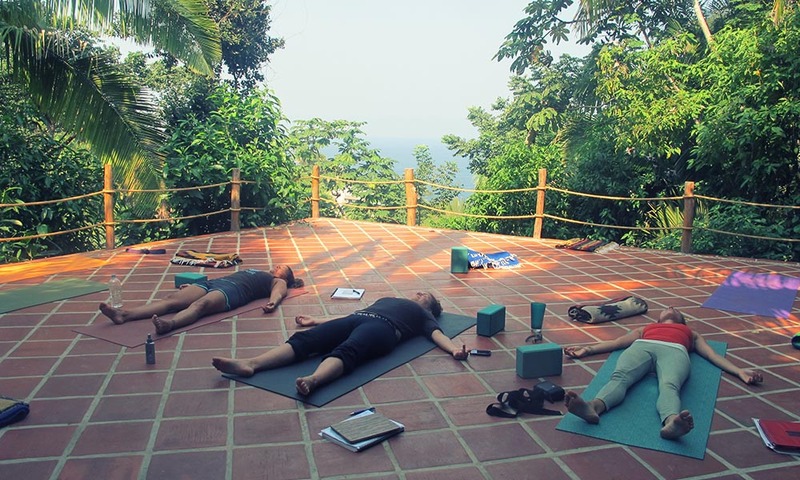 She had already done an Anusara immersion programme and was taking the Drishti Yoga course to add more strings to her bow, with the view of setting up a yoga/health coaching practice in her new home, Puerta Vallarta. Ruth had also practiced yoga for years, and it had helped her overcome some serious health problems. At one point in her life she couldn’t walk, but can now do a head stand and full wheel with no problem. 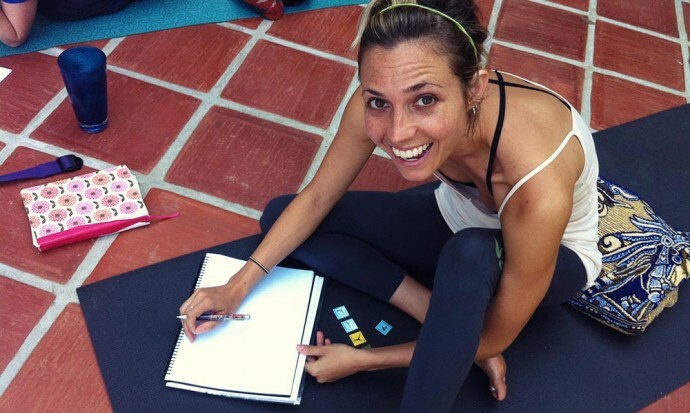 She lives on a tiny island in Panama and was doing the course to deepen her practice, and to be able to teach yoga to some of the local community. Both Ruth and Julia could do tons of things I couldn’t do and I felt intimidated to begin with, but slowly opened up when I realized my teaching could match theirs. All of us had different strengths and it was great to learn from one another. In the two weeks prior to the training, I had done hardly any yoga at all while I waited for my mole scar to heal. I was very out of shape, and it was a shock to the system to start practicing for hours every day. For the first ten days, we did the Ashtanga series every morning, which is very vigorous. Thereafter, we did Vinyasa, alternating between Sarah and Carri each day. Happily, my body soon got used to it and the morning practice left me feeling invigorated for the day. That’s not to say it wasn’t tiring, and at the beginning especially, I was exhausted by the end of the day. When you look at the schedule, it may seem as though we had just two yoga practices a day – the early morning session and the restorative in the afternoon. This wasn’t the case as during the 2.5 hour yoga teaching practice, we were often students for the practicing teacher. In that session, we started by going through all the different poses and breaking them down in detail. We then had a chance to practice teaching them ourselves. As the weeks went on, we started to devise our own sequences, starting at 5 minutes and building up to 30 minutes, working with different themes such as a particular body part, a chakra or one of the yamas. In the afternoons, we did a one-and-a-half-hour restorative practice, which is a relaxing, passive form of yoga that uses lots of props, and where positions are held for up to ten minutes. At first I found this quite slow, but soon learned to enjoy that meditative part of the day, lying beneath the blue sky and listening to the birds and waves. Every afternoon, after restorative yoga, we would have a two-hour theory class, starting for the first two weeks with anatomy, and the following two weeks with philosophy. I knew next to nothing about anatomy to begin with and was amazed by how much I learned, and how much it interested me. I’m tempted to do some further study into the subject, especially seen as I think it’s an integral aspect of being a great yoga teacher. I already knew that I was interested in yoga philosophy and it was awesome to go deeper into the subject. I especially loved reading and talking about the yoga sutras, and delving into the chakras. It’s opened the doors to a subject I think I’ll study for my entire lifetime. The big one – how did it feel? It was certainly intense, and I experienced a roller-coaster of emotions over the month. Some days I was euphoric, felling immensely connected to my body, nature and the world around me. Other days, I felt frustrated and lost, on the brink of, or in, tears throughout the day. One thing was for sure – the way I felt on the mat mirrored how I felt off the mat. If I struggled and got frustrated in my practice, the likelihood was I would struggle in my thoughts and actions too. Some of the yoga sessions, for example when we worked on the hips, left me feeling emotional for the rest of day – interesting because it’s said we hold a lot of pent up emotion in our hip area. I had days when I hated the course and days when I wished it would never end. As it progressed, I felt my moods balance out a little as I started to observe and respond, rather than react as things came up. Even in the moments of struggle, I appreciated that it was part of the journey. I always knew it was what I needed. That said, I relished the days off and enjoyed letting go with a cocktail or two in town. Before the course started, I wasn’t sure if that would be allowed, and was pleased by the relaxed outlook of the teachers. Yoga is something I want to integrate into my life, and I don’t want that to be at the expense of all fun and games. It’s really all about balance. Most important about ‘the feeling’ part of the course is that the effects have lasted well beyond it. I started the course truly believing that I was doing it to deepen my own practice. Perhaps I’d be a teacher one day but definitely not immediately after. As it turns out, I started teaching a week later. As the course progressed, my confidence grew and I realized, with the encouragement of my teachers, that I had what it takes to be a yoga teacher. That transformation has changed my life. I love teaching, I’m hungry to know more and I look forward to my lessons every day. It’s set me on a new, healthier and happy path in life. I nearly didn’t do the teacher training, thinking that I didn’t have the time, money or ability. Steve encouraged me to go for it, and I’m ever thankful for it. It’s one of the best moves I’ve ever made. I did a 200-hour Vinyasa Yoga teacher training course with Drishti International Yoga Teacher Training. They also offer 500-hour teaching, which I’m going to take sometime in 2013 or 2014.
this looks amazing, I’d love to do it! You should. It was one of the best thins I’ve ever done! Training is a learning course. It is a great way to study a new ability that you know how to make use of in your career, individual life or to get your personality goals. Sounds like an amazing experience. Yoga has defiantly improved my life and I’d like to grow with it. It really was a wonderful experience. I’d recommend it to anyone looking to delve deeper into yoga. It was life-changing for me. This sounds incredible. I’m fairly new to the world of yoga but I’m already amazed at how it can change the way you live your life. When I’m practicing I’m so much happier and calmer so I imagine it must be so rewarding to be a yoga teacher. It is! I learn from it all the time and it’s wonderful helping others too. Doing the course is definitely one of the best decisions I’ve ever made. Excellent post Victoria. I totally agree with your thoughts. Really nice work done by you. Thanks Leesa. I’m delighted you enjoyed it. Hi Mike, I’m so pleased the post was helpful. I would never have thought I’d be teaching yoga now, but six months later and I’ve taught four times a week ever since! Regardless of the outcome, the training is worth it anyway. Good luck! And namaste. This looks like it was an amazing experience, thanks for sharing! I’m inspired again to work towards my 500 hours and Drishti Yoga looks like a great possibility. All the best on your upcoming journey(s) (both travel and yoga related)! Thanks! I’m pleased yu found this useful. I definitely recommend Drishti – Carri and Sarah are wonderful! I’m sure Carri and Sarah will be happy to help. 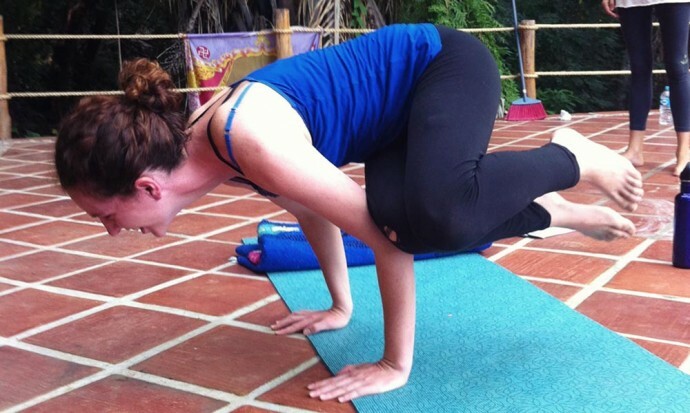 Hey, I’m planning to attend drishti ytt Costa Rica 2014, are Sarah and carri really good? Thanks for posting about what the day-to-day is like for YTT, as well as sharing your feelings about the journey. I am debating whether or not I can do the training myself and expect I’d encounter many ups and downs and moods during the experience. I’ve been researching the different trainings…. there are so many options out there! Thanks for your post! Sounds like a wonderful experience. Hi Becky. Glad this was useful to you. It is pretty overwhelming choosing a training! I didn’t thin I’d be teaching right away because I didn’t think my own practice was advanced enough. I didn’t think I was “good enough”. The training made me realise that teaching isn’t about being flexible / having the most advanced practice. It’s about being a good teacher. Thanks to share a great post, Amazing thoughts. Just like other courses, a yoga training course involves the teachings and the techniques that one should be well aware of to impart yoga education to others and as well to indulge in one’s own life. Hope that helps! I know it’s hard to choose one! I love how I’m learning things about myself mentally, physically and spiritually and how they are all connected. Going through my daily life I find myself thinking about the things I learned during my yoga practice. Things like my breathing, posture, letting go of things I can’t control and living in the present moment. Physically yoga has helped tremendously with my flexibility and strength. With my new eating plan and practicing yoga I have lost a little over 40 lbs. I’m starting to feel muscles in places I didn’t even know I had muscles! Very interesting article, I don’t get much time to do Yoga, but I feel good whenever I do it. I used to do it regularly when I was a college student. I never thought that Yoga teacher would be a lucrative career option in future. I am thinking of enrolling myself in 200 Hr Yoga Teacher Training Goa. I’m afraid to say I don’t think it is a lucrative career option. A fulfilling one, but not really lucrative! I have never tried Yoga, but I have heard of its benefits. I guess the biggest problem for me would be the finding time. Living in New Delhi and being constantly bombarded by almost everything– people animals, cars and some more people. I think a few days off could do wonders for my health both mentally and physically. I know many people who would probably follow-suit in my city, and perhaps make Yoga a fulfilling career. Yoga really change the way you look on life. I am a lot more optimist, and this is so good for me. Great post Victoria. I totally agree with your thoughts. Really good work done by you. Thank a lot for this helpful post. I appreciate the post very much. Good health is a key to success. Yoga is one of the popular technique of good health. So, I want to consider Yoga Teacher training programs. Very nice blog post Victoria! amazing information for selecting a suitable yoga ttc around the world. Interesting and great blog post Victoria! Great job. Its very amazing and helpful information for all people who are confused to choosing a suitable yoga teacher training center around the world. But on a serious note, this sounds very interesting to do, and its definitely on my list of things to do in my life. That being said, i would also like to take the opportunity to let you guys know about this event that I’m headed to in October. It’s the International Yoga Festival, being held in Mysore, Karnataka, and i was hoping to meet you and maybe your protégés could also join the festival. It’s going to be amazing. Sounds great! Hopefully I’ll make it one day! Nice Post. Thanks for sharing the information. ? Really nice post shared. I get so many nice and informative information for Yoga. Thanks for sharing such a nice post. Excellent post Victoria. I totally agree with your thoughts. I get so many informative information for Yoga. Thanks for sharing such a lovely post. This sounds mind-blowing. I’m genuinely new to the universe of yoga yet I’m as of now astonished at how it can change the way you carry on with your life. When I’m rehearsing I’m so considerably more joyful and more settled so I envision it must be so compensating to be a yoga instructor. 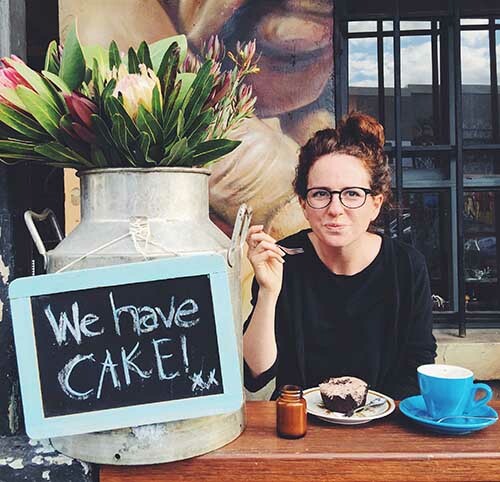 Informative and great blog post-Victoria! Very nice blog. All the details mention. Great job. Thanx for sharing such a great blog. Wow very nice post shared. I get so many nice and informative information for Yoga. Thanks for sharing such a nice post. Thanks for sharing. Have a healthy Life! It looks like it is an awesome experience. Doing something we really love is worth all the pain and effort that we do to achieve it. It only makes the achievement much sweeter. Thank you for sharing your journey.